How much better are Better Than Bouillon's vegetarian options? 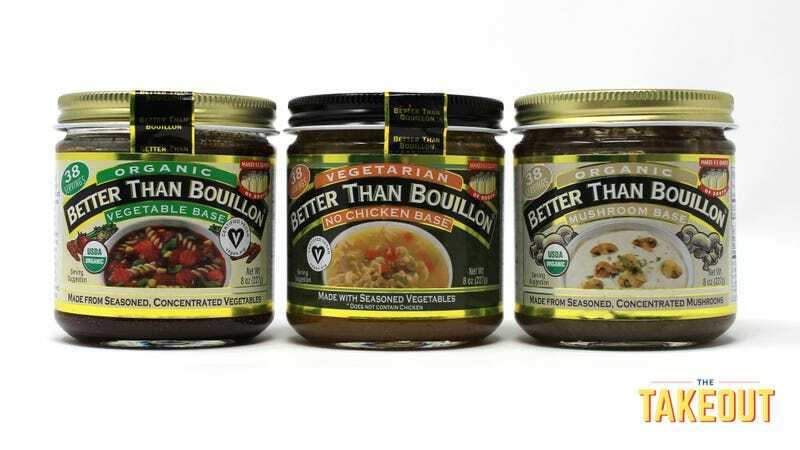 The seismic shift in the bouillon soup base world, if such a thing exists, is the emergence of Better Than Bouillon as the go-to brand for instant stocks. Home cooks seem to love it—count myself among the fans—because unlike the powdered cube stuff (artificial tasting) or boxed stock (takes up much shelf space, uses up quickly), the convenience of Better Than Bouillon is that you spoon a teaspoon of goo from the jar, add hot water, and the resulting soup tastes fairly clean and natural. We always keep jars of its beef and chicken soup bases in our fridge (no less an independent authority than Cook’s Illustrated agrees it’s good stuff). So color us intrigued at BTB’s vegetarian offerings, which begs to ask—can these taste as robust (which is to say, not flimsy and thin) as its meat bases? It’s the umaminess of its chicken and beef flavors that give the soups that rich, palate-filling qualities. We tested three of its non-meat bases and included tasting notes here. There’s a strong whiff of parmesan from the jar, but it’s likely from the butter plus garlic and onion powders. Mixed with hot water, the base transforms to a light beige stock (maybe I was expecting a deep brown mushroom tea?). It actually tastes like liquid stroganoff—a heavy initial taste of butter with a truffle-like, earthy backend. Fairly salty. It’s not a broth that you would drink as-is, but dilute this (I’d go 1 teaspoon of goo with 1 1/2 cups of hot water) and it would make a decent base for mushroom risotto. Now this, I would actually drink this as a hot broth. There’s a tinge of sweetness poking through from the tomato and carrots, and its mellow, well-balanced flavor reminds me of a good consommé. It’s a vegan stock packed with surprisingly full, rich savory notes (there’s soy sauce in there, too). Our minestrone would be improved with this as a base. For a control, I also made a cup of BTB’s chicken base for comparison. The “no chicken” facsimile, believe it or not, fared better in a blind taste test. The meat version is dominated by salt, where as the no-chicken version tilts the broth sweeter while maintaining a certain meatiness. (The turmeric adds a yellowness that aids in the chicken broth illusion.) The revelation to me is I’ll likely be switching to this vegan version of chicken broth here on out. It somehow tastes better than the real thing.